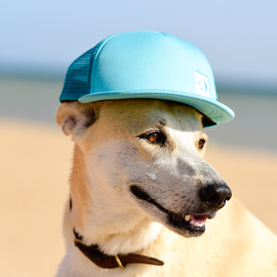 Because life’s better at the beach! 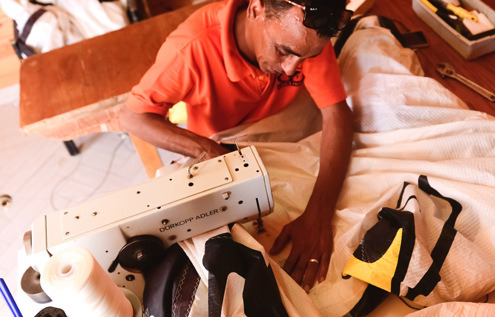 Exceptional places – such as the 7 Bft KiteHouse Somabay – originate when passionate sportsmen come together, foster an unique idea and work on it with all their enthusiasm. 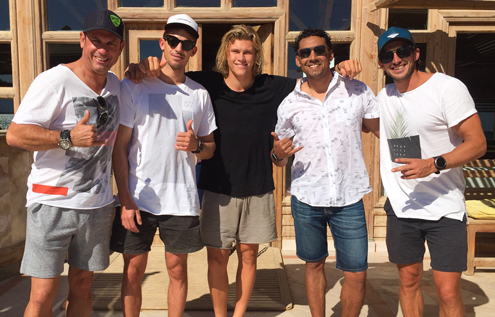 An oasis for kitesurfers at one of the best flat water spots in the world with the perfect set-up for the ultimate kitesurfing holidays. A place to feel good, disconnect and relax! Leave all your stress back home and enjoy every minute! 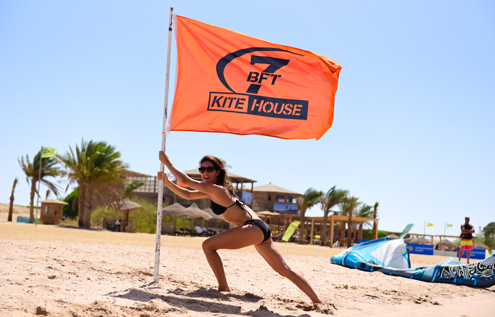 Whoever already visited different kitesurfing spots around the world quickly realizes: there is a reason why the 7 Bft KiteHouse belongs to the top kite stations of the world. In Egypt it is considered one of the biggest in the country and is open 365 days per year. A free shuttle will pick you up at any of the Somabay hotels. We host a shop with kite accessories as well as a kite repair service. The storage area and the air conditioned station are supervised around the clock. Ready cash is not necessary, as everything can be charged to your room. Free WiFi, hot showers, chill out areas, a restaurant and other features are expecting you. 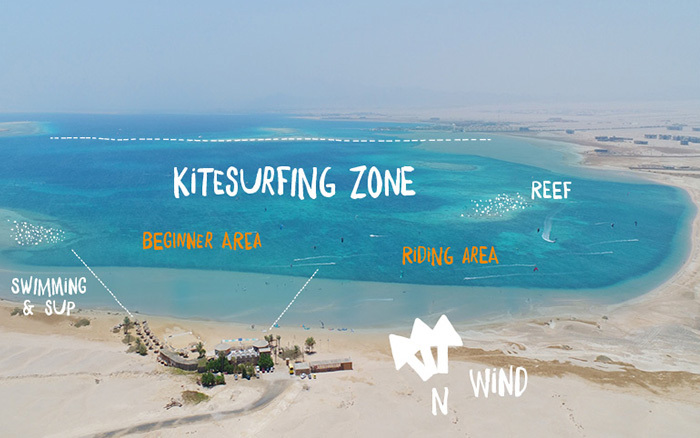 It is our pleasure to show you around and to point out what makes the kite station so special. This is Somabay! The water in the bay is – even with 8 Bft – smooth like polished marble. The perfect conditions for your first steps on the board, to try out new tricks or just to sweep along and cruise around in the beautiful bay. Also the pro riders value our spot due to the perfect „laboratory” training conditions and the atmosphere at the KiteHouse. Gisela, Youri, Bruna, Liam, Karolina, Stefan, Paula, Hannah – just have a look at our VIP Gallery ! 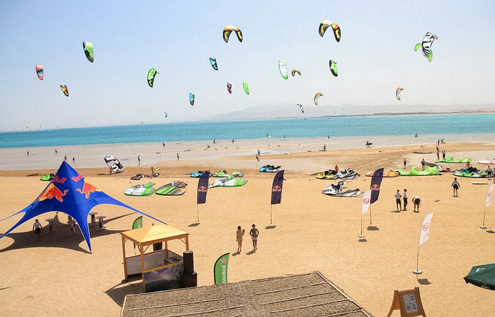 The „African Kite Racing Championships“ – belonging to the world biggest kitesurfing competitions – and have been hosted twice successfully at the 7 Bft KiteHouse Somabay. From beginner up to pro – we cater to all levels! Safety is our first priority and therefor our spot is offering more than enough space for everyone. The spot is subdivided into a teaching area and a free-riding area. 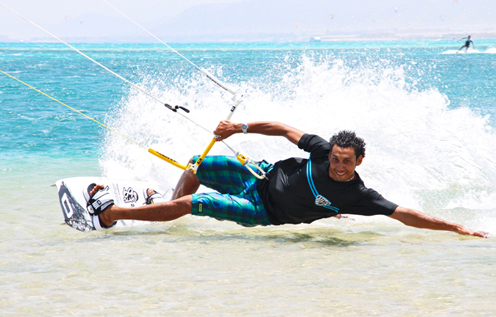 Advanced kiters can rock’n roll and practice their jumps, whereas beginners can take their first steps in kitesurfing in safe waters. And should you face any kind of difficulties, our rescue boats are not far away to assure you reach again safe shores. 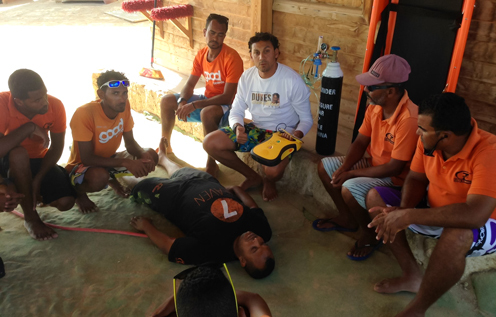 Also good to know: our team participates on regular basis trainings concerning safety, emergency first responder and right of way rules on the water. The Somabay peninsula is reached from Central Europe in only 4 hours by plane. It is situated 45 km south of Hurghada and it’s just 30 minutes by car from Hurghada International Airport. The spot is a true gem of nature, embedded between the heavenly Red Sea and the impressive Red Sea Mountains. 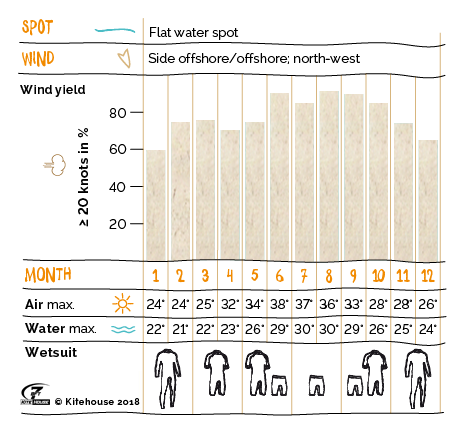 The location and the difference in temperature between mountains and sea provide the side offshore winds of Somabay; thermic winds getting stronger the higher the temperatures. Thanks to the constant early winds, the all year wind statistic is fantastic. For more information, check out our wind&weather graphic. For more fun and fairness on the water, some rules have to be observed. 1) Wind from port gives way to wind from starboard = right hand leading means priority. 2) Windward gives way to leeward 3) Keep clear while overtaking. 4) The rider entering the water has right of way. Check out the video for more information! 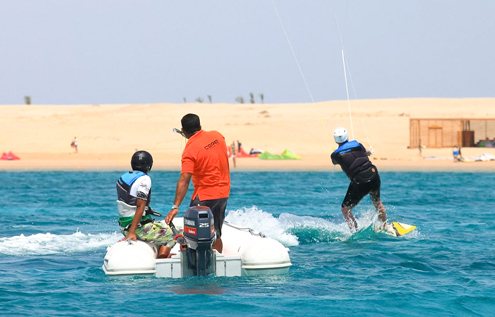 Our goal: that you feel good and safe while learning kitesurfing. To allow you – even in deep water, with a lot of space – the best and fastest possible learning success, our teaching boats are near by. Our 7 Bft rescue service team guards the water during the day with several boats and will be quick by your side in case you experience an awkward situation. You see, you are well taken care off. Kitesurfing is considered an extreme sport and accidents can happen. To be prepared, our team therefore consistently practices – drills and theory – the emergency. Better safe than sorry! The successful kite vacation not only consists out of wind and a great time on the water but also out of a perfect set-up, where you can feel good and enjoy every minute. 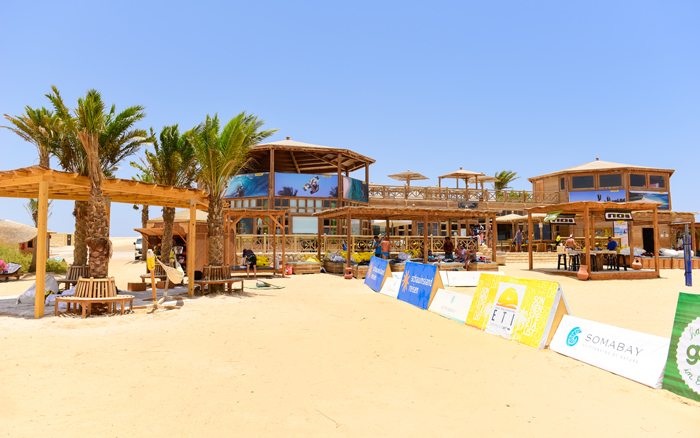 All this, the 7 Bft KiteHouse Somabay provides: free shuttle bus to reach the spot, snacks in between to regain power, cool drinks following an eventful day, neat bathrooms, shade, chill out areas, kite repair service and a shop where you can get some nice souvenirs or a new boardershort. 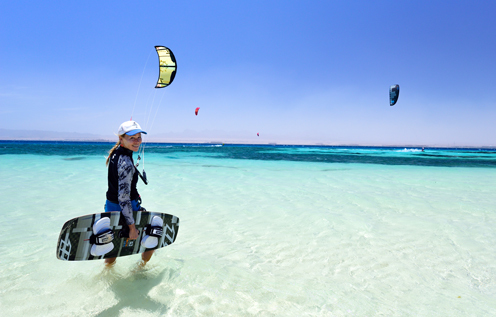 At the KiteHouse you’ll find everything your “kitesurf-heart” may wish for. And if you fancy a change of scenery: join our downwind trip to “the island” for one day! 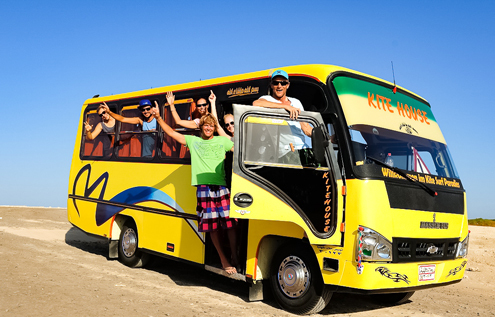 Our free shuttle bus service – running in frequent intervals – brings you within a few minutes from your Somabay hotel to the KiteHouse and back. Schedules are provided at the KiteHouse as well as at the reception of your hotel. Hop on the bus and see you at the KiteHouse! A day on the water makes one hungry and thirsty. Therefore we also cater for your physical well-being. 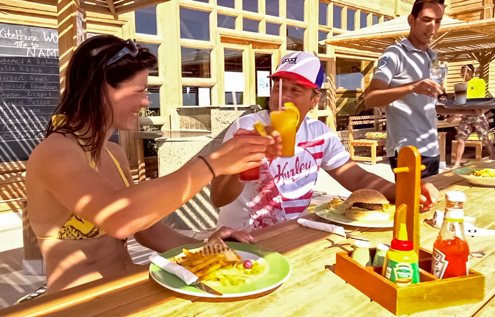 Our restaurant awaits you with burgers, vegetarian dishes, salads, coffee, cocktails, ice, refreshing juices and much more. Come and refuel with us! Bon Appétit! You forgot rash guard, board shorts or sun screen? 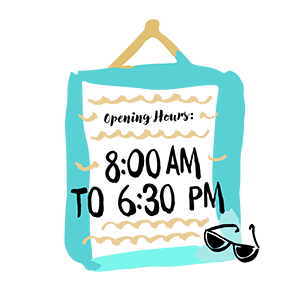 You like the t-shirt with the KiteHouse logo? Or you prefer the cool messenger bag manufactured with old kites? 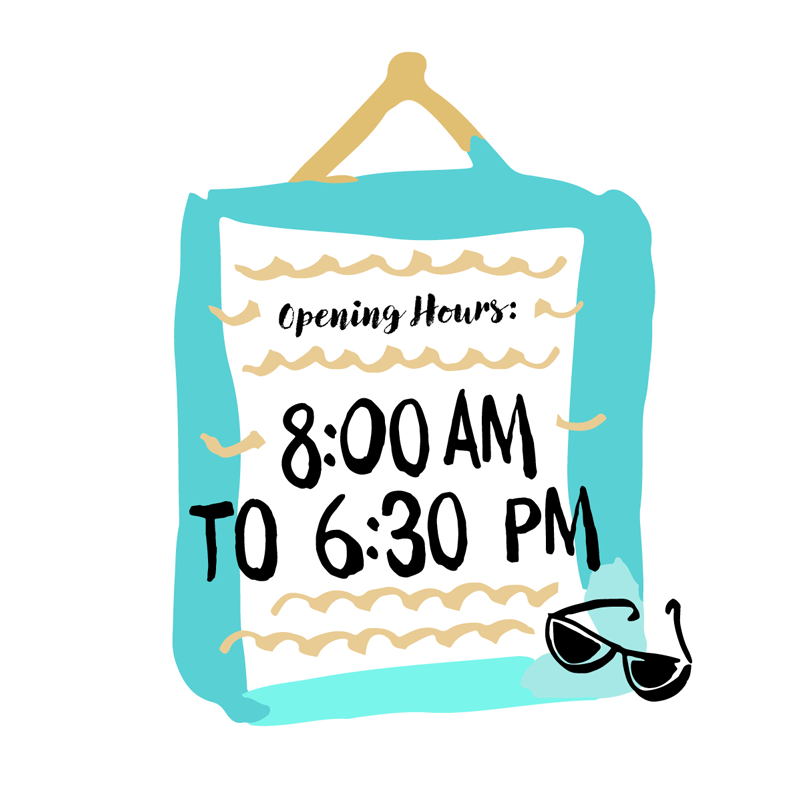 The shop team is looking forward to welcoming you. Of course there is also the one or other souvenir to be found. Our photographers know exactly how to make the best and most impressive kite shots. They are daily in the water and on the beach to catch your moments of glory. After you kitesession you can check out your pics at the reception. Be it a torn kite, a hole in the tube, a missing screw in a strap or a bigger mishap: our experienced team from the repair service will help you to get your equipment as fast as possible again up in the sky or on the water. Drift with the wind, kite around Tobia Island, in between a quick snorkeling session and back comfortable by boat – these are our downwind trips to the island. For more information and our schedule, please contact our reception. Enjoy! Dear Rosi takes her task as guard dog of the KiteHouse very seriously. But even if she looks at you with her big brown eyes as if she was not fed in 10 days: don’t fall for it! She gets enough food! But we have to admit, once it comes to food, Rosi is an excellent actress and melts the hearts of even the toughest guys! Still: please don’t feed her!